NEW YORK (WABC) -- 'Tis the season for holiday parties in the workplace. While the mood is festive and relaxed, it's still a work function, and there are things you should remember as you navigate the holiday gathering, or you could be risking your career and reputation. In fact, Michael Lonnay with All About People, a recruiting and hiring franchise in New York City, says that according to surveys about 15% of companies who have holiday parties say inappropriate employee behavior has impacted an individual's career growth at that company. So before heading off to your office holiday party, you should take a look at this list of workplace party faux pas. You may even want to check it twice. 1. Excessive Eating - People who attend events understand that food and drinks will be part of the experience. Enjoy the hors d'oeuvres and buffet, but don't eat like it's your only meal for the week. Properly discard napkins, toothpicks, etc. instead of leaving them on the table. You don't want to be labeled as the "messy" party attendee. 2. Excessive Drinking - This is probably the most common mistake some employees and leaders make at company holiday celebrations. Don't forget where you are - at work! - with coworkers and managers. Treat the party as an extension of your work day. Keep in mind that everything has the potential to turn into a judgment about your professionalism. Limit drinks with alcohol to a maximum of two. Regardless of an open bar, nobody should over-consume! 3. Inappropriate Attire - You're not going to a club, you're going to a work party. Leave the form fitting, low cut, sequined dress in your closet and lighten up on the new perfume. For men, dress conservatively as well. Same goes for your new cologne ... easy does it! This may be a holiday party, but you're rubbing elbows with your coworkers, not your friends and family. Think about the image you'd like your coworkers to have of you in the coming months. You do need to see these people - and work with them - again on Monday morning. 4. Forgetting to Mingle - Be sure to acknowledge all your coworkers. This is a great opportunity to spend time with associates you don't know, as well as leaders in the organization. Talk to your coworkers and bosses about work only in a positive fashion. No one wants to listen to someone complaining all evening. Engage your coworkers and management about topics outside of work like hobbies, family, etc. Don't forget to listen. That's as important as small talk! 5. Poor Attendance - This is a work function. Some think if they show up discreetly late, circle the room once, speak to a few colleagues, the boss and a direct counterpart that they will be safe to leave 20 minutes later. Understand this: showing up fashionably late is not okay. Arrive within the first 30 minutes if possible. Everyone remembers who stayed for just a few minutes. Senior managers should make a point of staying as long as possible. That means if you're not there when the event starts, you should certainly stay until the end. 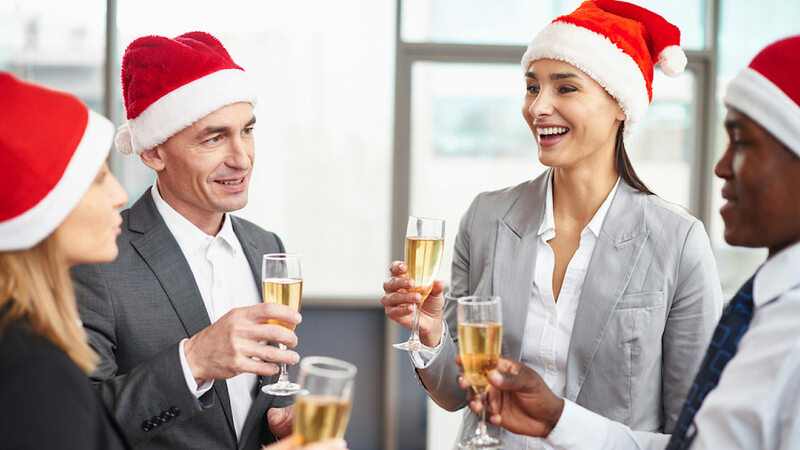 Lonnay adds that making these mistakes at your office holiday party can have a real negative impact on your career growth. "One of the worst mistakes you can make is forgetting you're still at work," Lonnay said, "How you behave at your office holiday party will reflect on you as an employee - good or bad."